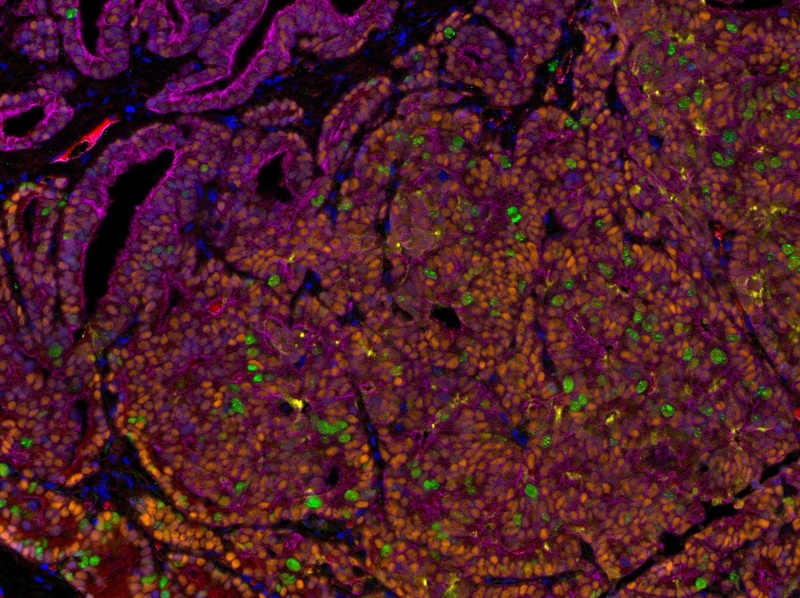 The EACR Image of the Month competition highlighted both scientifically and visually stimulating cancer research images from EACR members.  We love celebrating the work of EACR members and during a visit to the Barts Cancer Institute in London, one of our members mentioned the need to promote high-quality scientific images. Considering this, and other feedback from members, we came up with the EACR image of the Month competition, which launched in September 2016. 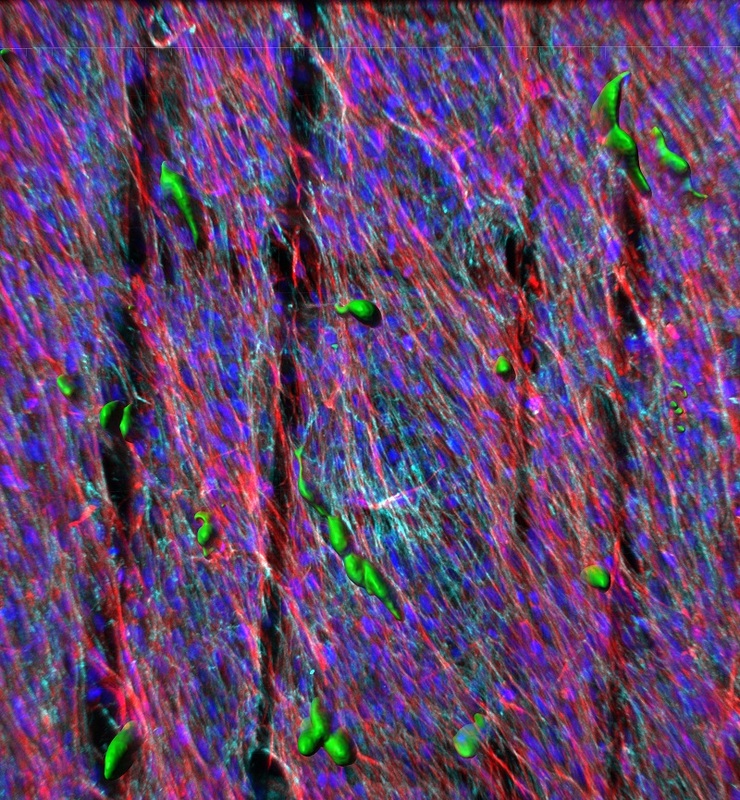 Working with a group of EACR Ambassadors each month, we selected winning images that capture the beauty in the research process. We received entries from all around the world with our winners coming from 10 different countries: Australia, France, Germany, Ireland, Netherlands, Portugal, Slovakia, Sweden, UK and the USA. You can explore the winning entries in the gallery below. This is two human squamous carcinoma cells invading into a collagen rich gel. After plating the tumour cells onto the gel, which contained human fibroblasts, the gel was left overnight at 37 C and fed with growth media placed underneath the gel. The gel was then processed for cryo-scanning electron microscopy. The image is a cross-section of the two cells where the gel was snapped in half. You can see that overnight the cells have invaded down through the collagen fibres so that only their surfaces are at the surface of the gel. Careful observation will note that the upper collagen fibres are thicker and smother whereas many of those at the invasive front look ‘gritty’. We believe from this and other data that the tumour cells have secreted enzymes to degrade the collagen. Submitted by: Dr. John Marshall, Barts Cancer Institute, London, UK. Sample processing and EM: Ms Anne Weston, Cancer Research UK London Institute, UK. This image shows increased F-actin staining in human bladder cancer cells after photodynamic therapy. After plating the cancer cells, they were incubated with a photosensitizer compound and then irradiated. 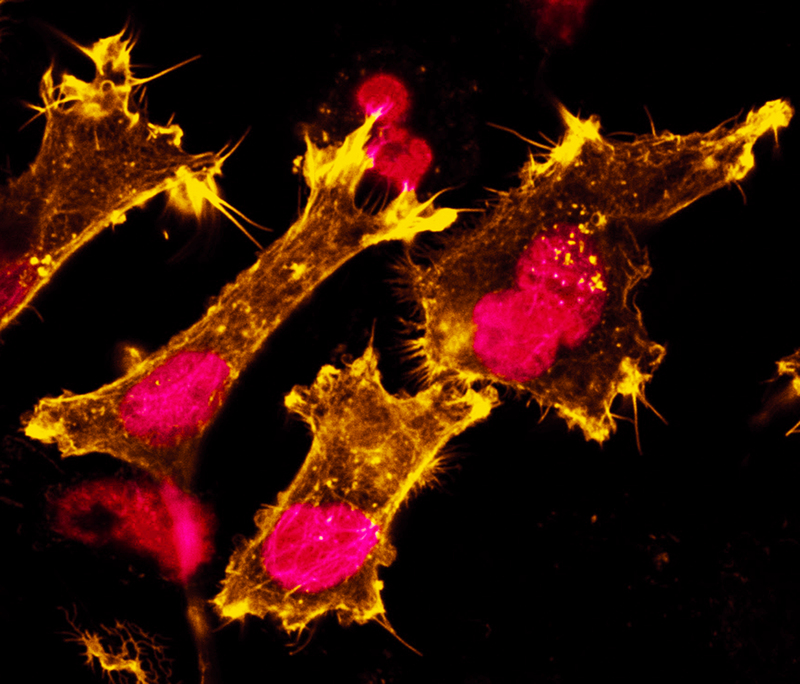 The cells were then stained with markers of F-actin (yellow) and nucleus (pink). 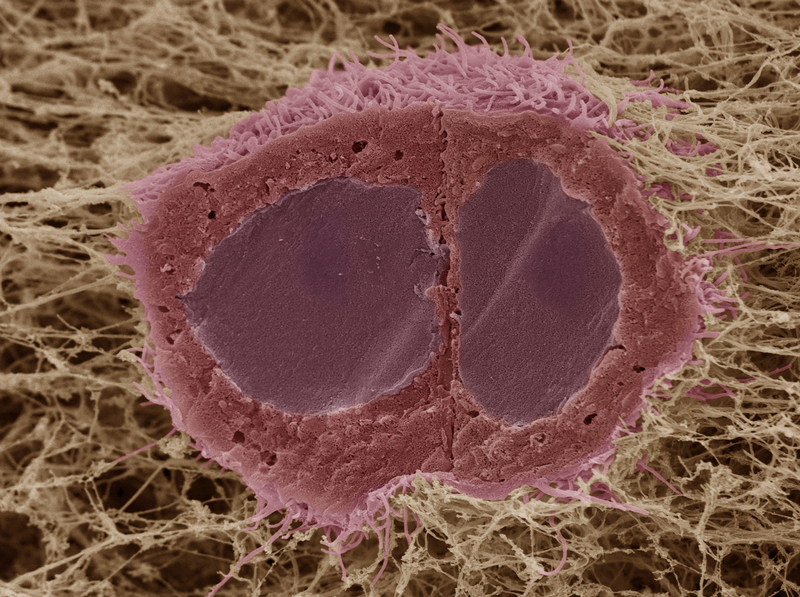 F-actin, a component of cytoskeleton, has key roles in cell morphology and membrane integrity. 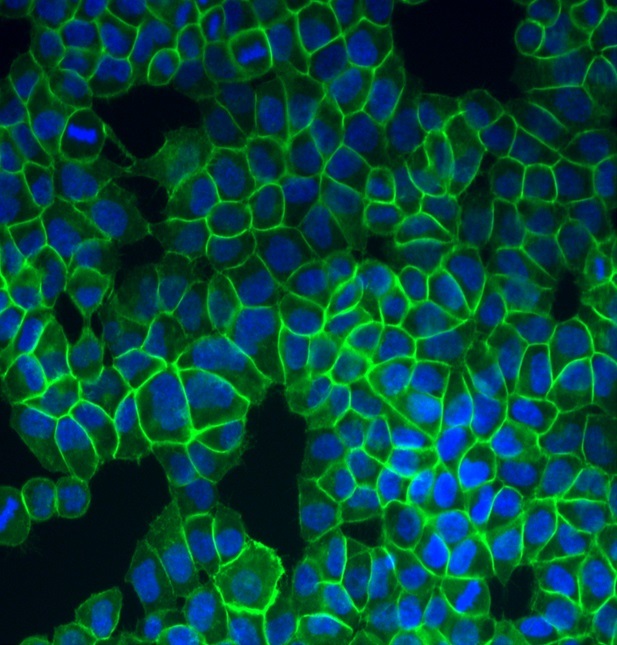 The image demonstrates that F-actin staining increases in the sites of cell protrusion after treatment indicating a reduction in cell – cell interaction. We believe from this and other data that cytokesleton structures are potential targets in the treatment of cancer. Submitted by: Patrícia Manuela Ribeiro Pereira, PhD student at the University of Aveiro, Portugal and the Faculty of Medicine at the University of Coimbra, Portugal. This is a mouse colonic mysencymal cell at passage nine on a cover glass. After isolation by collagenase and dispase, cells were grown on a petri dish and passaged every 3-5 days. 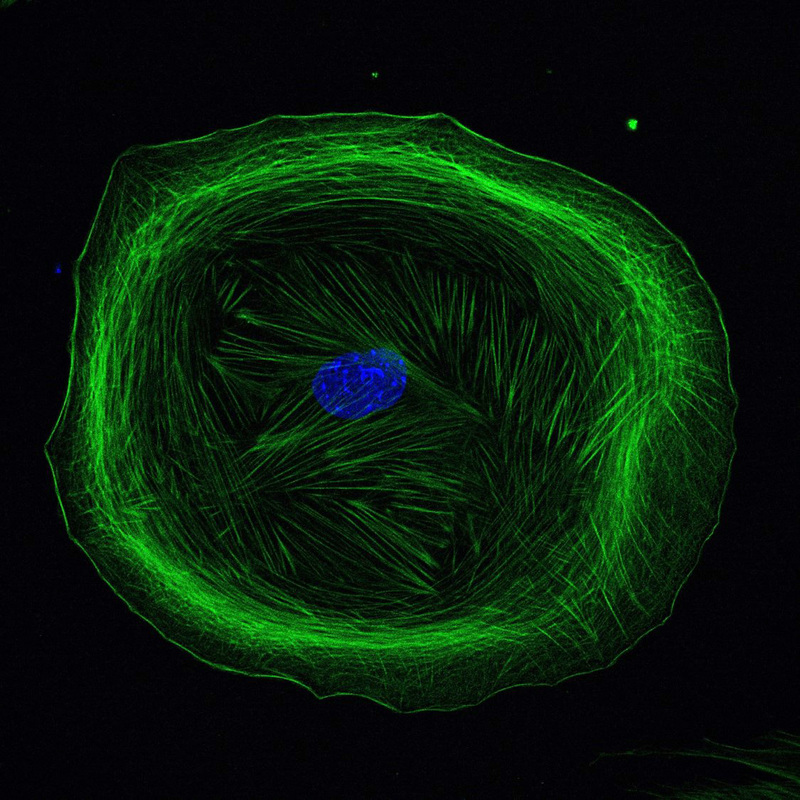 At different passages, cells were placed on a cover glass, then stained with DAPI (blue) and anti-α smooth muscle actin (αSMA, green) after 24 hours. We found that the staining pattern of αSMA changed after culture. This suggests we should pay more attention to in vivo experiment when we study colonic mysencymal cells. Submitted by: Ruizhi Tang, 4th Year PhD Student, Institut de Génétique Moléculaire de Montpellier, Montpellier, France. This image is representative of a 3D melt electrospun scaffold model of the human prostate tumour microenvironment, which incorporates primary cancer-associated fibroblasts (CAF) and benign epithelial cells (BPH-1). The primary CAFs (rhodamine phalloidin – red) are first seeded onto the scaffold where they proliferate and deposit native extracellular matrix (ECM; fibronectin – cyan), resulting in neo-microtissue formation. After this, BPH-1 cells stained with CellTracker Green are co-cultured on top of the microtissue construct. After 24 hours, morphological transformation of the BPH-1 cells is observed, as they take on an elongated and spindle-like shape, indicating early malignant transformation. Submitted by: Brooke Pereira, PhD Student, Department of Anatomy and Developmental Biology, Biomedicine Discovery Institute (BDI), Monash University, Melbourne, Australia. 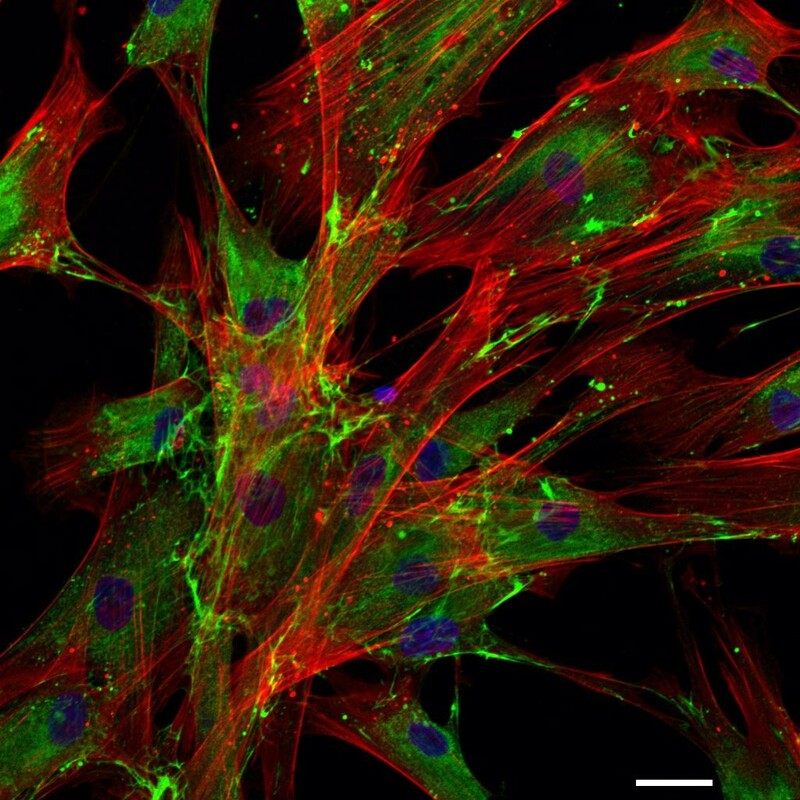 This picture shows cancer-associated fibroblasts isolated from primary neuroblastoma tumour obtained at the time of surgical resection. After digestion with collagenase and Dnase, cells were isolated by fluorescence-activated cell sorting and stained for CAF markers. 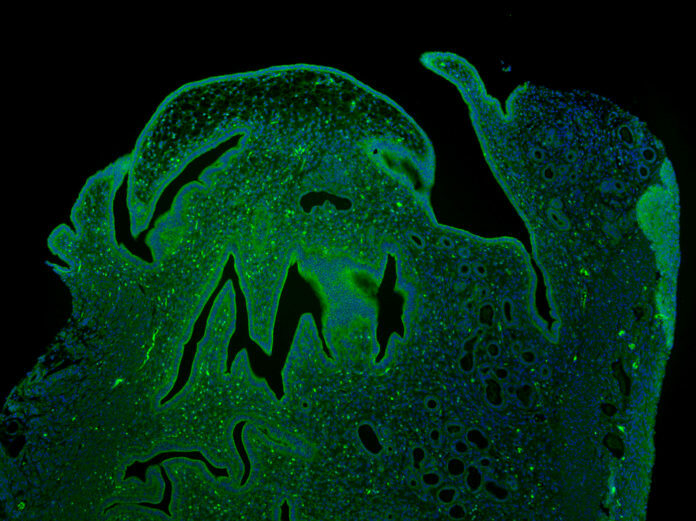 This is a representative immunofluorescence image captured by confocal microscopy of CAF stained for Fibronectin (green) and counterstained with Phalloidin (red) and DAPI (blue). Scale bar = 50 μm. Submitted by: Lucia Borriello, PhD and Yves DeClerck, MD in the Division of Haematology-Oncology, Children’s Hospital Los Angeles, California, USA. 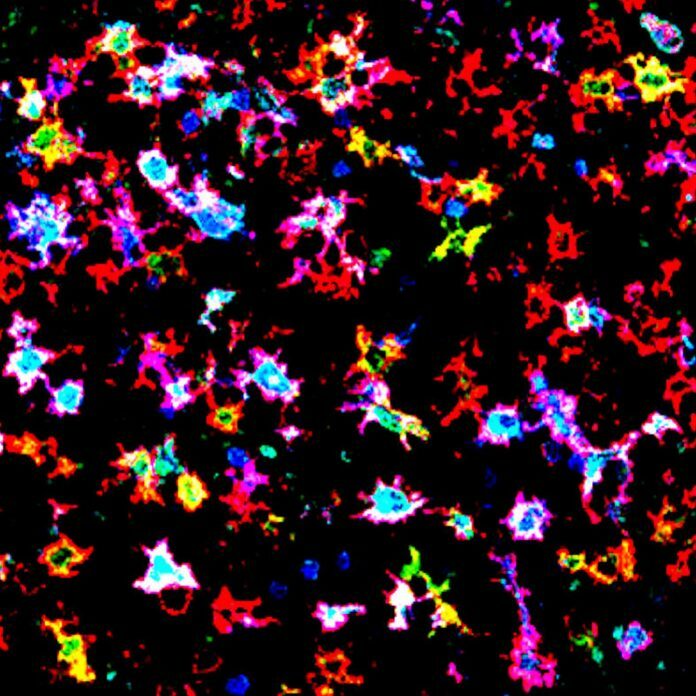 The image depicts immune cells, macrophages and dendritic cells, in a lymph node follicle of a kidney cancer patient. The image originated from a study in which cancer and lymphoid tissues were investigated in detail using three colour immunofluorescence and confocal laser scanning microscopy for the presence of various immune cells. In this case, macrophages and dendritic cells both of which express HLA-DR (red). Strong expression of s100 (blue) is a marker of dendritic cells. IDO (Indoleamine 2, 3-dioxygenase, green), which depletes tryptophan thereby inhibiting proliferation of T cells, can be seen on both DC’s and macrophages. Original magnification x400. Transformation to bright expression of colour markers was performed to accentuate the aesthetic characteristics of the picture. The photograph is one of a collection of artistic images of the immuno-art project. This project has been set up by Florry Vyth-Dreese to raise funds for improving immunotherapeutic research and treatment. To this end, microscopic images were transformed into large and colourful artworks. People interested to obtain an artwork can mail and donate to this crowd funding project via the website www.immuno-art.nl. Submitted by: Florry Vyth-Dreese, PhD, formerly Netherlands Cancer Institute, Amsterdam, Netherlands. The image depicts a section of murine uterus stained against acetylated α-Tubulin, a marker of cilia, and counterstained with DAPI to visualize nuclei. We stumbled upon this tiny uterus monster (approximately 1.5×1.0mm) giving a “thumbs up”, while investigating the distribution and the significance of motile cilia in the reproductive tract of female mice. Motile cilia of the fallopian tubes are thought to promote ovum transport; however, the precise role of cilia in the uterus remains to be resolved. Submitted by: Tilman Esser and Dr. Muriel Lizé, Molecular & Experimental Pneumology group, University Medical Center Göttingen, Germany. 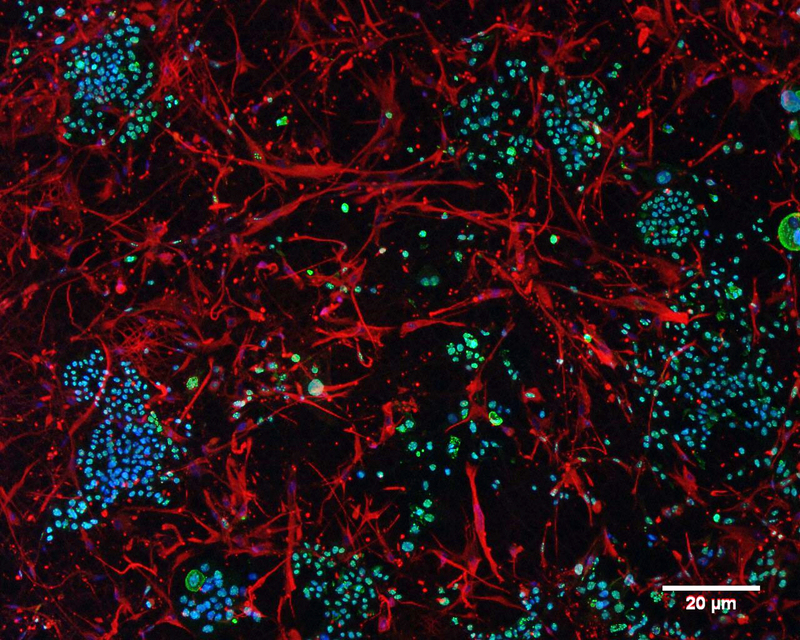 This picture shows an immunofluorescence image of JIMT-1 breast cancer cells and human dermal fibroblasts co-cultured for one week in a 3D polycaprolactone cell culture model. JIMT-1 cells preferentially made small clusters and tend to grow separately from the fibroblast with a higher proliferation rate. Fibroblasts specifically express vimentin (red, Alexa 594) while JIMT-1 cells do not (Ki67: green, Alexa 488). Cell nuclei were stained with bis-benzamide (blue). Images were taken with an Olympus AX70 fluorescence microscope. Submitted by: Atena Malakpour, 1st year PhD student, Department of Biology, Lund University, Sweden. A link between β-catenin and various cancer types has previously been described. In a cisplatin resistant model of NSCLC, H460 cells were examined for expression of β-catenin by immunofluorescence using primary anti-β-catenin and secondary Alexa Fluor® 488-labelled antibodies. Cells were analysed using the IN Cell Analyzer 1000 system. 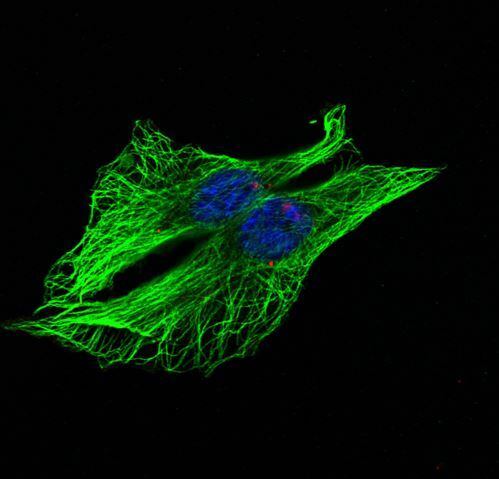 Cells showing green fluorescence are representative of β-catenin expression and localization while nuclear staining is shown in blue (Hoechst 33342) at ×40 magnification. Submitted by: Dr. Martin Barr, Clinical Scientist & Adjunct Assistant Professor, St. James’s Hospital & Trinity College Dublin, Ireland. Altered (typically elevated) expression of NEDD9 is strongly associated with cancer. NEDD9 is rarely if ever mutated, but frequently shows altered expression or phosphorylation (associated with increased activity) in pathological conditions including immune cell dysfunction and cancer. NEDD9 overexpression is documented to occur and in some cases links the process of tumorigenesis of many different malignances. Several studies have considered the potential value of NEDD9 as a therapeutic target or therapeutic guide. Because of lack of a kinase domain, or any defined catalytic domain, and because it is entirely intracellular, NEDD9 is a difficult molecule to target. Because NEDD9 serves as a scaffolding molecule for other signaling proteins that play significant roles in cancer development, the effects of NEDD9 overexpression in supporting metastasis could in theory be mitigated by inhibition of its downstream targets. Consideration of NEDD9 as a biomarker for therapeutic response is a promising research direction. Submitted by: RNDr. Martina Šemeláková, PhD., researcher at Pavol Jozef Šafárik University in Košice, Faculty of Science, Institute of Biology and Ecology, Slovakia; the picture was created during study in the Department of Cell and Molecular Pharmacology & Experimental Therapeutics, Medical University of South Carolina, SC, USA. 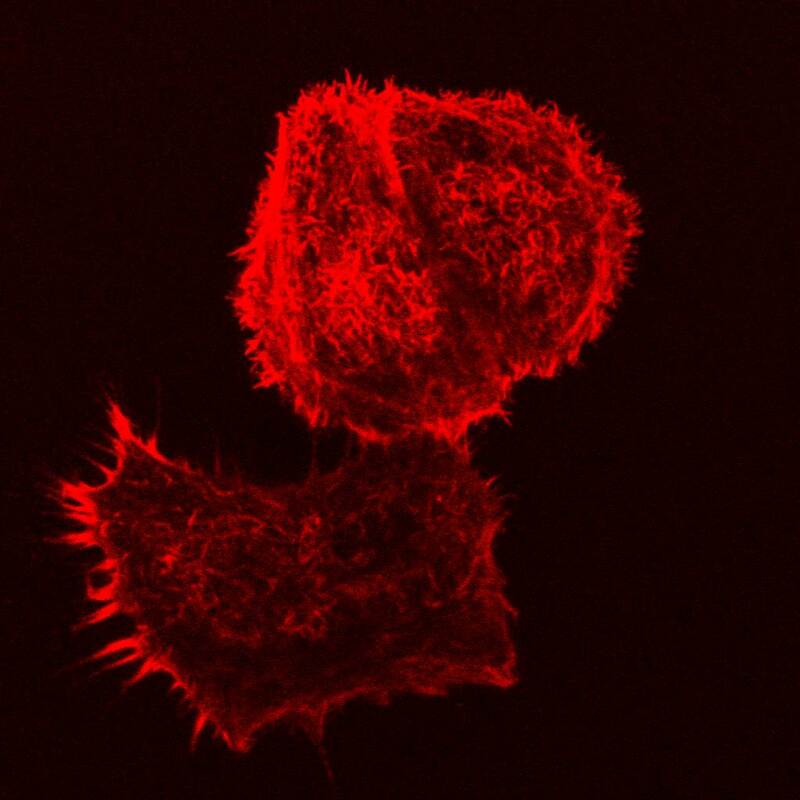 Fluorescent image shows the interaction of extracellular vesicles (EVs) (red) with potential recipient triple negative breast cancer (TNBC) cells. Extracellular vesicles (EVs) are known to contain functional RNA, protein and metabolites which, in recipient cells, can propagate the tumourigenic phenotype. The transport of these particles through the blood or lymphatic systems has been documented, their ability to induce angiogenesis and set up metastatic niches in distant sites around the body proven. Inhibiting the entry of these biologically functional particles into recipient cells or even their initial release from TNBC cells could be a novel way to stem the metastasis spread so common in TNBC. Submitted by: Ms Sinéad Lindsay MSc and Prof Amanda McCann PhD, UCD School of Medicine, University College Dublin, Ireland and the UCD Conway Institute of Biomolecular and Biomedical Science, University College Dublin, Ireland. This fluorescent image shows expression of 5 biomarkers (Ki-67 [nucleus, in green], PSMA [membrane, in yellow], Androgen Receptor [nucleus, in orange], AMACR [cytoplasm, in red] and CK18 [cytoplasm, in magenta]) and DAPI in a single tissue section of a lung metastatic prostate cancer. It is obtained after performing a multi-step immunofluorescence procedure, in which each protein is labelled with a specific wavelength, allowing for visualization of all the biomarkers simultaneously. Image is acquired and processed with the CRI Nuance multispectral imaging camera and software (Perkin-Elmer). This technology permits quantification and co-localization analyses at the sub-cellular level of the different biomarkers of interest. Magnification: 200X. 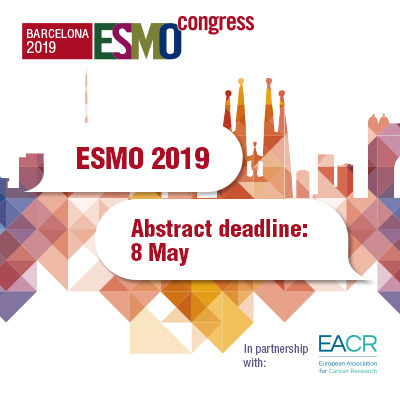 Submitted by: Sara Correia M.Sc., and Mireia Castillo-Martin, M.D., PhD., Department of Pathology, Champalimaud Centre for the Unknown, Lisbon, Portugal. Sometimes, seeing is believing. Structural biology visualises the cell’s macromolecules to understand their function, both in health and disease. The successful determination of a protein structure by X-ray crystallography yields an electron density map, which structural biologists next interpret by building an atomic model of the protein. 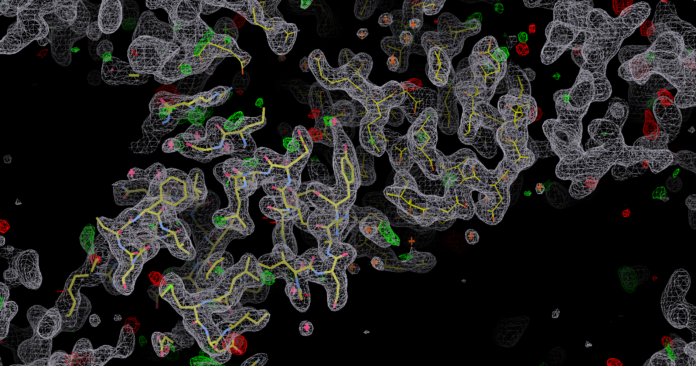 The image shows such an electron density map for the so-called SAM (sterile alpha motif) domain, a filament-forming protein module from a protein known as Tankyrase 2. The atomic model of the SAM domain has been built into the electron density. The crystal structure enabled the discovery of polymerisation-dependent roles of Tankyrase in Wnt/beta-catenin signalling, a pathway critical to the development of most colorectal cancers (Mariotti et al., 2016, Molecular Cell 63, 498–513).